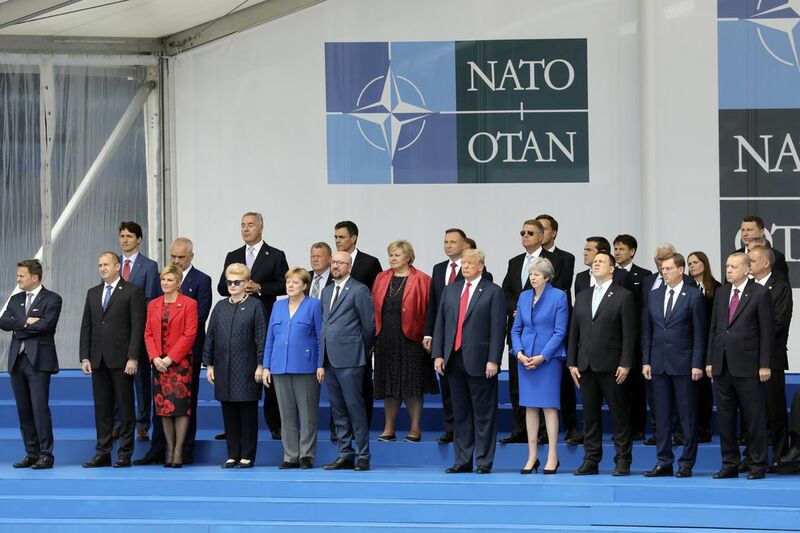 BRUSSELS – President Donald Trump reaffirmed U.S. support for NATO on Thursday, after he upended a summit here to admonish leaders and demand they quickly increase their defense spending. Trump's ambush jolted the transatlantic alliance, and some diplomats perceived his comments as threatening a U.S. withdrawal from NATO. But Trump later declared in a news conference, "I believe in NATO," and, as he prepared to depart Brussels, he reiterated that the United States is committed to its Western allies. "I told people that I'd be very unhappy if they did not up their commitments very substantially," Trump told reporters after the meeting. "Everyone's agreed to substantially up their commitment. They are going to up it at levels never thought of before." NATO member nations committed in 2014 to spend 2 percent of gross domestic product on defense by 2024, though only eight countries will reach that goal this year. It was not immediately clear what specific new commitments were made here. Trump said that leaders responded to his demands by agreeing to reach the 2 percent goal soon. "Ultimately, that will be going up quite a bit higher than that," Trump said at the news conference, after privately calling Wednesday on leaders to double their commitments to 4 percent of gross domestic product. An official who was in the closed-door session said German Chancellor Angela Merkel recommitted to meeting the NATO goal of 2 percent spending by 2024 – an increase from Germany's current plan of 1.5 percent by that date. But that was nothing more than a restatement of Germany's existing pledge, and there may be considerable wiggle room for leaders to do nothing new, many officials said. Leaders explained to Trump that they could not make firm commitments inside the closed meeting, since most of them needed parliamentary consent to expand budgets. In a news conference afterward, Merkel did not announce any new pledges but said that "there was a clear commitment to NATO by all." "We made clear that we're on the way," she said. French President Emmanuel Macron also said that leaders agreed to live up to their current spending commitments. But he said he questioned whether Trump's push for even higher spending goals made sense. "I don't even know if it is a good measure and fits our collective security," Macron told reporters. Trump used a session to intended for discussion of Georgia and Ukraine – two countries that have tense relations with Russia – to trumpet his spending concerns and rail against European countries, including Germany and Spain, for failing to contribute more to their defenses and relying too heavily on the largesse of the United States. NATO Secretary General Jens Stoltenberg later told reporters, "All allies have heard President Trump's message loud and clear." "We understand that this American president is very serious about defense spending, and this is having a clear impact," Stoltenberg said. "After years of decline, when allies were cutting billions, now they are adding billions. Before, the trend was down; now, the trend is up." Trump's Thursday demands sent "everyone into a tailspin," according to one diplomat briefed on the morning's events. Trump came armed with facts and figures, and it appeared to be a well-planned attack. In the closed-door session, Trump told his counterparts that if they did not meet their defense spending targets of 2 percent of gross domestic product by January, the United States would go it alone, according to two officials briefed on the meeting. The officials said Trump threatened to "do his own thing." The comments appeared open to interpretation, and some officials said they never felt Trump was threatening a full pullout from NATO. Another official who was in the room said that Trump read out the spending figures for every single NATO nation, sometimes telling leaders sarcastically: "My friend, you're so nice to me. I'm sorry you're spending so little." Asked why NATO leaders rushed into an emergency meeting, Stoltenberg did not single out Trump and told reporters only, "We all felt that we needed some more time for a good discussion on burden sharing." When the summit began Wednesday, Stoltenberg said, there were "differences between allies," but that after its conclusion Thursday, "I feel NATO is more united now." During Trump's impromptu news conference, he was asked whether he could withdraw the United States from NATO without congressional approval. The president replied, "I think I probably can, but that's unnecessary." He added: "The people have stepped up today" as they never have before. "Everyone in the room thanked me. There was a great collegial spirit in that room. . . . Very unified, very strong. No problem." At a discussion near the summit sponsored by the Atlantic Council, Sen. Thom Tillis, R-N.C., emphasized that Capitol Hill still fully supports the 29-member alliance, saying: "There is no applause line for 'let's get out of NATO.'" "Again, ladies and gentlemen, the American Congress weighs in on all these matters," Tillis said. "Unlike Russia . . . we have co-equal branches that weigh into these matters." At the news conference, Trump went on to call NATO "a fine-tuned machine," a phrase he has used to describe his often-chaotic administration, and said that "NATO is much stronger now than it was two days ago." When he was asked by a reporter whether he would change his tune about NATO once he boarded Air Force One and got on Twitter – a reference to his turnaround after a Group of Seven summit in Canada last month – Trump said he would not and called himself a "very stable genius." Trump said Germany agreed to accelerate its defense spending increases. He pointed to what he said were $33 billion in NATO defense spending increases this year as evidence that his push was having an effect. He also said, inaccurately, that NATO nations had been decreasing their spending until he was elected. In fact, they began their spending increases following Russia's 2014 annexation of Crimea, although the increases have accelerated in response to his push. "They are spending at a much faster clip; they are going up to the 2 percent level," Trump said. He said leaders committed to go to their parliaments to obtain the spending increases. He said the increase would happen in "a very short number of years." Trump last week told senior aides he was going to make threats about defense spending and that he was determined to flip the table over before he left, a senior administration official said ahead of Thursday's drama, speaking on condition of anonymity to discuss sensitive summit planning. That tough message was transmitted clearly in Brussels. "Everyone in the room understood we would be coming to a disaster if we did not resolve this situation today," one of the officials present for the conversation said. The official said there was fear that Trump could repeat his performance at the Group of Seven summit last month, when he pulled his consent from the closing declaration in a fit of pique after first agreeing to it. If that happened at NATO, officials said, the alliance could be sent into a crisis. "The discussion left many people in the room confused about what the actual position of the United States is or what the consequences would be," said Amanda Sloat, a scholar at the Brookings Institution who was briefed by an official in the room. "His remarks were essentially a bombshell that went off and caused NATO officials to scramble to interpret what he meant." In his discussions with Europeans, Trump also complained about the expense of NATO's new $1.4 billion headquarters. He noted that he knew the architect and believed NATO officials overpaid for the building, according to two officials with knowledge of the conversation. Despite the tensions throughout the summit, Trump and other leaders held a cordial dinner Wednesday night. He made no mention of the combative breakfast with Stoltenberg that morning, when Trump bashed NATO allies on defense spending and slammed Germany for its dependence on Russian energy. Trump spent the evening bragging about the press turnout at his summit with North Korean leader Kim Jong Un, according to an official with knowledge of the dinner who spoke on condition of anonymity to discuss the private gathering. The official said Trump told his counterparts that he had recently called golfer Jack Nicklaus to boast: "They have 1,000 cameras at the Oscars, and we had 6,000 cameras in Singapore. The buzz was fantastic." Tim O'Brien, a Trump biographer, said Trump "likes the ideas of their leaders being destabilized and therefore easier to manipulate for him. He is trying to make everyone look weak and doesn't understand how all the moving parts work. He sees it as a zero-sum game where the United States can call the shots." The Washington Post's Josh Dawsey, John Hudson, Seung Min Kim and Quentin Ariès contributed to this report.